How to sew a nice men’s vest part 2 | I Sewed This! If you haven’t made a vest before, you should make it out of muslin first. Not only will this enable you to get the fit right before you cut into the good fabric, you’ll be able to check the lengths of seams and understand how it goes together. So first cut out the fabric and interfacing. Sorry, I couldn’t find any photos of the vest being cut out, just of it being sewn. Spread out your fabric and lay the pattern pieces on it. If you have a fabric with a design, lay the fronts so that you take advantage of the part of the pattern you want to show more. Weight the pattern pieces down. Don’t pin them. Why not? Pinning distorts. 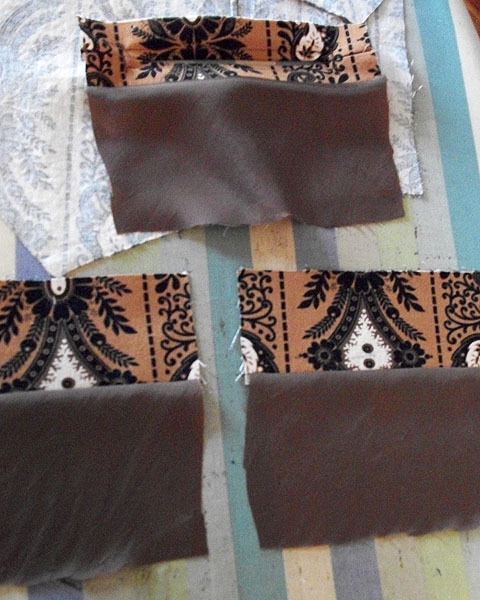 You can see if you take some scrap fabric, especially thicker or fluffier fabric, and cut out rectangles, one where you pinned the pattern piece and another where you weighted it and traced around it. Trace around the pattern pieces. We have used chalk from a chakoner, ball point pen and china marker. They don’t bleed. 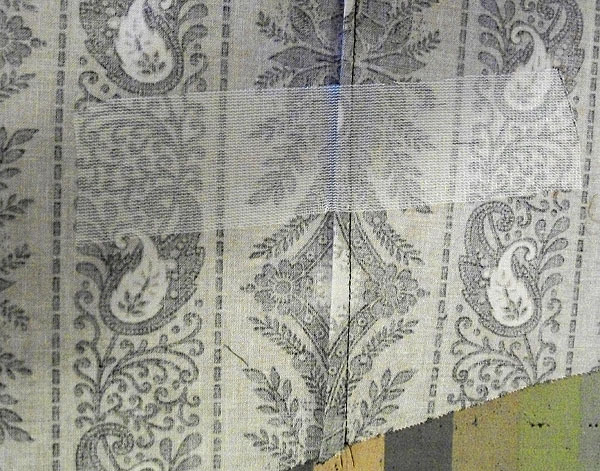 After you’ve traced the pattern onto the fabric, remove the pattern. Cut the pieces out of the fabric, cutting off the lines. (See, you don’t have to worry about the lines ruining your fabric.) With tracing wheel and tracing paper, mark the darts on the wrong side of the front and back pieces. 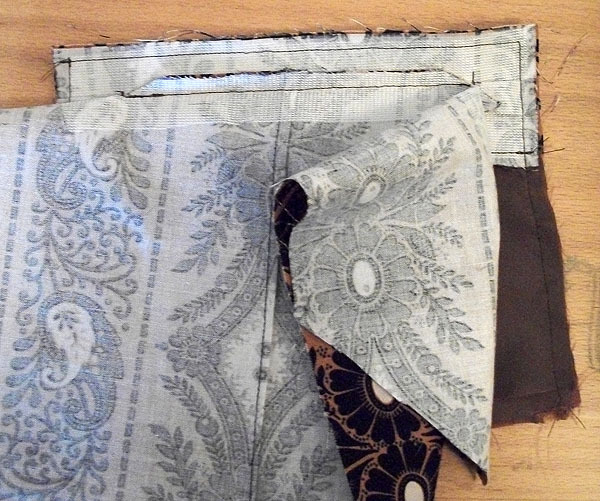 On the right side of the fronts, make some light dots on the right side of the fabric where the pockets will go, just the opening, not the rest of it. Keep the pattern handy in case you need to refer to it while you sew. 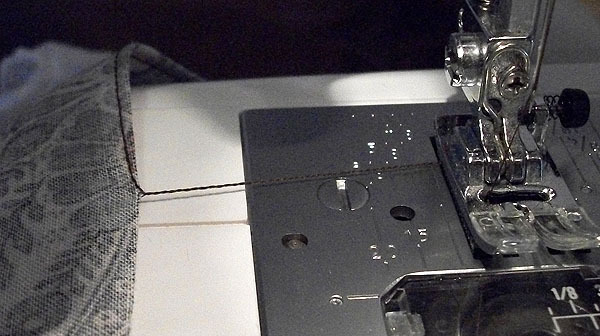 Before you start sewing, fuse the interfacing to the facings, welts, and underwelts. 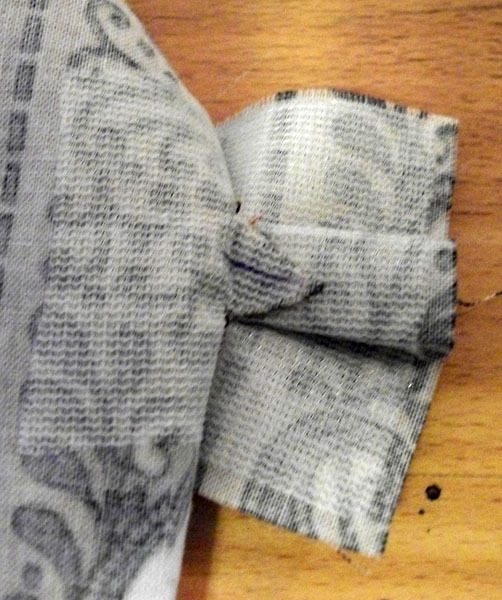 You should fuse a strip of it to the spot on the fronts where the pockets will go (on the wrong side, of course). Use a pressing cloth. I made one out of off-white silk organza. It takes the heat and I can see through it. 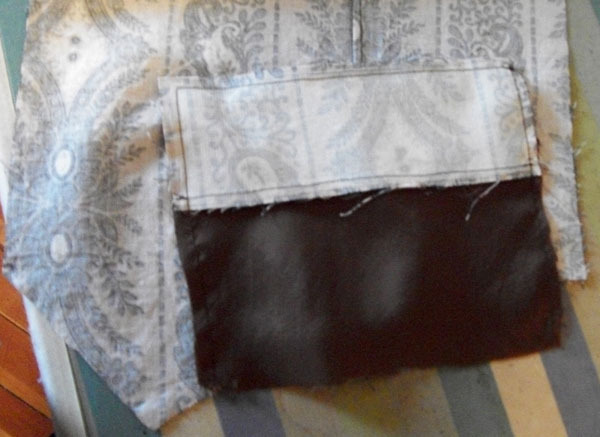 If you want to use velvet or a thick fabric, the welts for the pockets won’t work very well in that same stuff. Use something thinner, like satin or something. I used the waxy kind of tracing paper. I don’t think you can get it at a fabric chain but you might be able to find big sheets at a specialty place that supplies higher end “couture” type stuff. You can use the chalky kind but it doesn’t stay on the fabric as long. To be really accurate when sewing darts, you can hand baste them with silk thread or pin them. 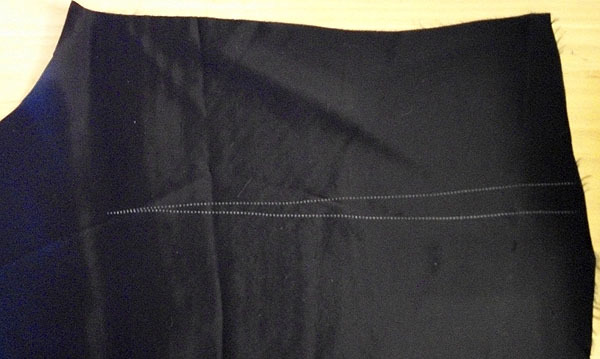 Start stitching from the hem end of the dart and go toward the point. Some people back stitch at the point, but some people chain off. Chaining off is when you keep sewing and run off the fabric, which leaves you a twisted “chain” of thread. This is less bulky, but do whatever you like. When you have that stuff done, you’re ready to make the pockets. If you’ve followed and practiced the tutorials, especially out of the fabric you’re using, you know exactly what to do. BTW, the set of welt pocket ones, not including the first and last links. Yes, it takes time. No, it’s not complicated. Yes, you can do it! 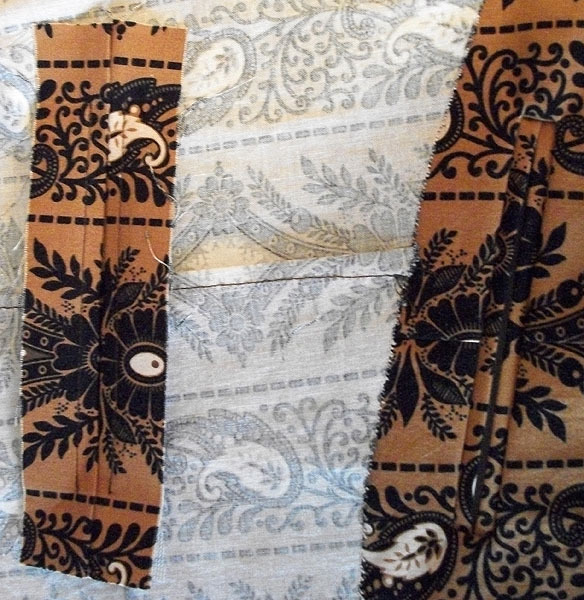 I was working on 2 vests at once at this point, which is why there is different fabric. Now the next thing to do is to cut between those parallel lines of stitching, from 1 end to the other, but with little triangles on the ends and a straight line in the middle. One point of the triangle meets the line and the other two ends meet the ends of the stitching. Another view of the welts turned over. Make sure you press them. See that little triangle that was formed when you cut the slit? Sew that to the welt. 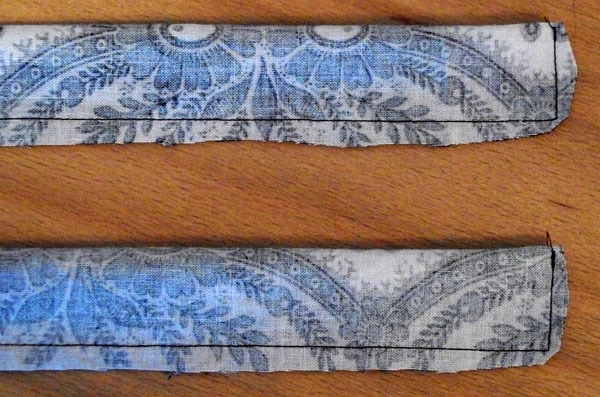 On the right you can see the triangle sewn very closely along 1 of its sides. 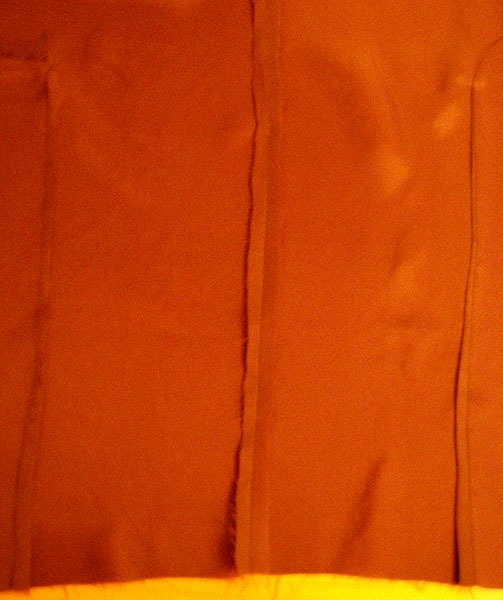 On the left you can see the stitching at the end of the slit. 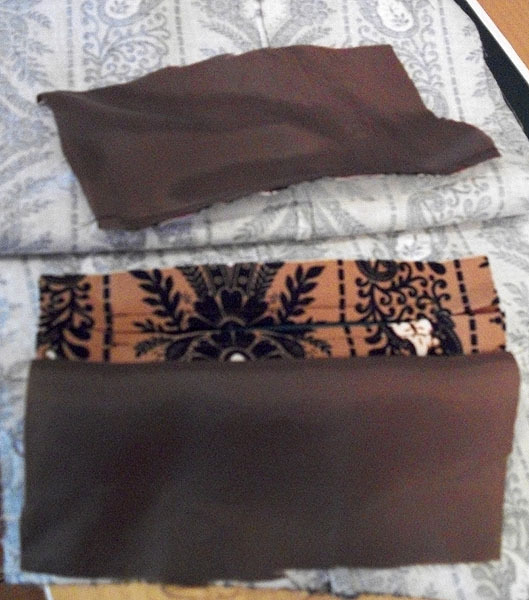 Now that the welts are sewn to the fronts and pressed so they lie flat, sew one of the pocket bag pieces to the bottom of one of the welts, then sew the other. 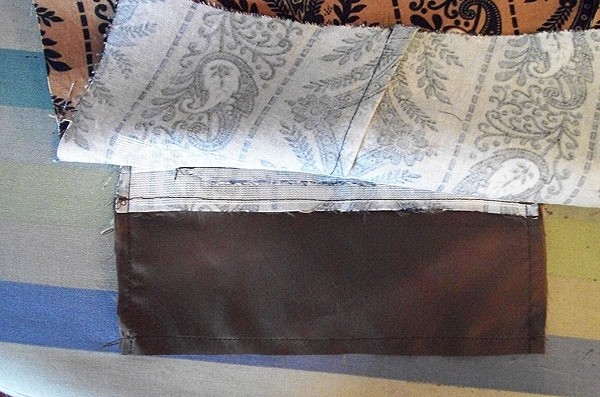 Then sew the pocket bag pieces to the bottoms of the underwelts. Press. Sew the sides and top. Check and trim the bottom and sew the bottom shut. The pockets are too long. See one peaking out from under the front, on the left? Mark with chalk or something, cut, and stitch the bottom. The bottom of the pocket sewn. The pockets are now complete. Since this was a lot of photos you had to wait for to download, and I need to eat something, the next post will have the rest of the steps on how to sew the vest. I will try to get to it later today, but at least you won’t have to wait very long. Thanks for reading and please let me know if you have any questions, comments, or suggestions. You did a nice job, pretty! 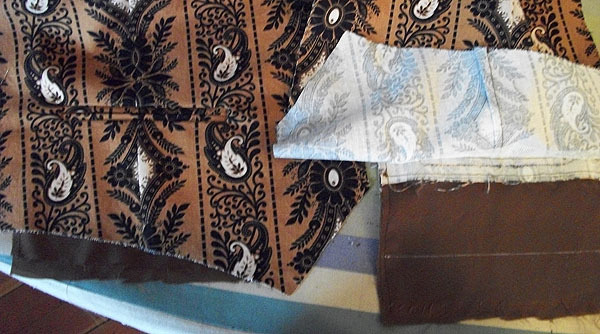 Pingback: Regency era vest | Look, I Sewed This!